…Only this time around they are sponsored by the U.S. Government and guaranteed explicitly by the Taxpayers. I say “explicitly” because Government agency-issued mortgages are directly guaranteed. In 2008, the Government bailed out the banks who had issued subprime mortgages and related derivatives, but the Taxpayer never signed up for the multi-trillion dollar bailout, which largely transferred wealth from the middle class taxpayer to the Too Big To Fail bank executives. In an attempt to off-set the falling velocity in the housing market, taxpayer-backed Fannie Mae and Freddie Mac have reduced their credit standards on guaranteed conventional mortgages several times over the last 3 years. 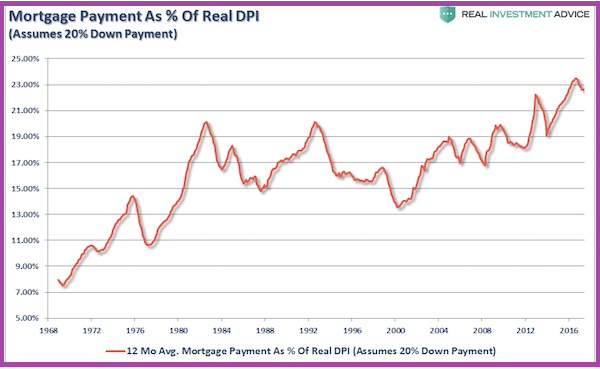 In 2015 they reduced the down payment requirement to 3% from 5%. In addition, they reduced the amount mortgage insurance required on mortgages with less than 10% down. Then they allowed “soft dollar” contributions to count as part of the 3% down payment, like seller concessions or realtor commission concessions. They also allowed homebuyers to use loans from other sources to fund the down payment. In this manner, a homebuyer could prospectively buy a home with a taxpayer-guaranteed mortgage using no cash out pocket. Then last June (2017) Fannie and Freddie raised the Debt To Income (DTI) ratio from 45% to 50%. DTI is the ratio of monthly debt payments (all forms of household debt payments) to the borrower’s monthly gross income. A borrower with a DTI of 50%, including the new mortgage, is using 50% of monthly net income to make debt payments (mortgage, credit cart, auto, student loans, personal loans). The chart on the right shows the spike-up in the number of conventional mortgages issued by Fannie and Freddie once the DTI was raised (source: Corelogic w/my edits). As you can see, before the DTI was raised the number of mortgages issued with a DTI over 45% was one in twenty. After the change, the one in five new mortgages backed by the taxpayer were issued to homebuyers with a DTI over 45%. 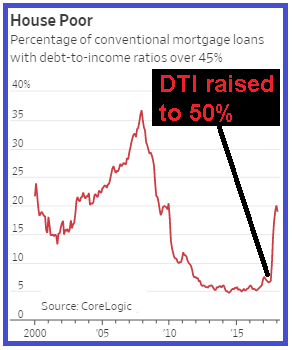 This is, by far, the highest level of high-DTI mortgages since the financial crisis. But the story gets worse. The Urban Institute conducted a study of high DTI mortgages and discovered that 25% of all Fannie Mae mortgages issued to borrowers with a credit score below 700 had a DTI over 45% in just the first two months of 2018. This is up from 19% a year earlier. This is after Fannie Mae reported a $6.5 billion loss in Q4 2017 that the taxpayers will cover. The Government raised the DTI in order to stimulate home sales by inducing households, who could otherwise not afford the monthly cost of home ownership, into taking on even more debt to purchase a home. The majority of these home “buyers” will ultimately default and the taxpayer will get the privilege of eating the loss. Zillow Group Is Now Flipping Homes? – Zillow Group stock plunged as much as 11% on Friday after it announced that it would be adding home flipping to its home-listing services. Clearly the market was spooked by this announcement – and for good reason. 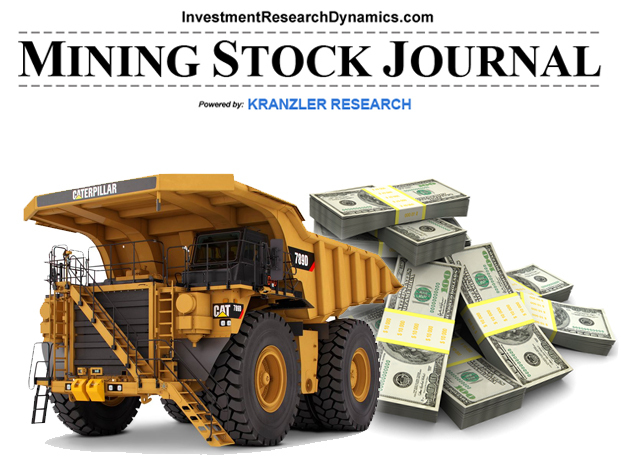 The plan will significantly raise ZG’s risk profile and will require the assumption of $10’s of millions in debt, depending on the number of homes ZG holds on its balance sheet any given time. It’s plan now forecasts holding up to 1,000 homes by year-end. ZG stock is extraordinarily overvalued. The Company released its Q4 and full-year 2017 earnings on February 8th and the numbers had little affect on ZG’s stock. ZG continues to generate operating and net losses. It incurred a $174 million intangibles write-down in Q4 2017 that was related to its 2015 acquisition of Trulia. While the Company and Wall St. analysts will remove this write-down as “non-recurring, non-cash,” it is indeed a write-down that occurred to an asset for which Zillow overpaid by at least $174 million. As the housing market fades, ZG will likely incur bigger write-downs of its “intangibles and goodwill,” which represents 85% of ZG’s book value. The move into home-flipping signals, at least in my view, that ZG has determined that its current business model will never be profitable. The decision to test home flipping in Phoenix and Vegas can be seen as desperate attempt to generate income. Ironically, in the last housing bubble, flippers in those two markets were decimated. I don’t see how this will end well for ZG, especially now that Congress is exploring rules changes to Fannie and Freddie that will raise the cost of conventional mortgages. The conventional mortgage user is the prime market for home flippers and now the average conventional mortgage applicant has de facto sub-prime credit. By the way, just for the record, on average and in general, home prices are coming down quickly in most markets. Case Shiller is severely lagged data and it emphasizes price gains from flips. Robert Shiller used to admit to these facts publicly. Now he’s a bubble cheerleader like everyone else who sold out. Taxpayer: Get ready to eat more losses on the housing and mortgage market. The commenetary above is from my latest Short Seller’s Journal. For the past several issues I have been focusing on both short-term and long-term homebuilder short ideas. 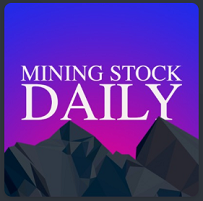 Several of my subscribers have told me they are making double-digit percentage gains on the ideas presented. 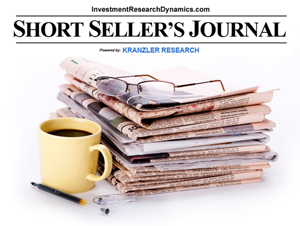 You can learn more about this unique newsletter here: Short Seller’s Journal information. Existing home sales declined nearly 2% in June from May on a SAAR basis (Seasonally Adjusted Annualized Rate). (SAAR is the statistically manipulated metric used by industry organizations and the Government to spin bad monthly economic data into an annualized metric that hides the ugly truth). Here is the NAR-spun fiction: “Closings were down in most of the country last month because interested buyers are being tripped up by supply that remains stuck at a meager level and price growth that’s straining their budget…” – Larry Yun chief “economist” for the National Association of Homebuilders. I hate to call Larry Yun a “liar” because it sounds unprofessional. But what else am I supposed to call him when the data completely contradicts the narrative he shovels from his propaganda port-o-let into the public domain? I have no choice. AS you can see, from 1999 to mid-2015 and from mid-2016 to present, inventory and sales are inversely correlated. This has been the worst selling season for the housing market’s peak sales months since 2011. In 2011 the Fed was dumping trillions into the housing market and mortgage finance system. To make this morning’s report worse, mortgage rates have been declining at a steep rate since the end of December. Near-record low rates, combined with near-zero percent down payment Government-guaranteed mortgages combined with the lowest credit-approval standards since 2007 combined with the peak selling months should have catapulted home sales much higher this year. The graphic above shows the average household mortgage payment as a percentage of disposable personal income (after-tax income). The graphic above is for those households with 20% down payment mortgages. As you can see, that ratio is at an all-time high. It’s far worse for households with 3% down payment mortgages. Either the Government will have to roll-out a program that directly subsidizes the households who still want to over-pay for a home but can’t afford the mortgage payment let alone the cost of home ownership – i.e. helicopter money – or the housing the market is getting ready to head south. This won’t end well either way. As for the inventory narrative. New homebuilders are bulging with inventory. How do I know? Because I look at the actual balance sheet numbers of most of the publicly traded homebuilders every quarter. Newly built homes sitting in various stages of completion or sitting complete but completely empty often are not listed in the MLS system. There’s a rather large “shadow inventory” of new homes gathering dust. This fact is reflected in the fact that the rate of housing starts has been declining for most of the past 8 months. There’s plenty of new home inventory and homebuilders are open to price negotiation. This is evident from the declining gross margins at almost every homebuilder. This is the type of analysis that is presented in the Short Seller’s Journal. I research and dig up data and present facts that will never be reported by Wall Street, industry associations and the financial media. This is why my subscribers were short Beazer (BZH) at $14.99 on May 21st. It’s currently at $13.39 but has been as low as $12. It’s headed much lower. Despite the Dow et al hitting new highs, there’s a large universe of stocks that are plumbing 52-week and all-time lows. 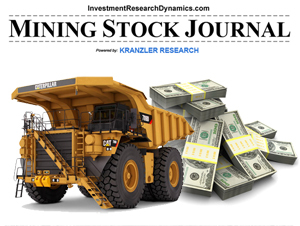 You can find out details about the SSJ here: Short Seller’s Journal information. In the latest issue I present an in-depth analysis of Netflix’s accounting and show why it’s a Ponzi scheme.